For ten years we have been collecting testimonials in a virtual cardboard box. These testimonials were fundamentally buried inside of our customer service system under the FAQs. New technology has permitted to bring these testimonials out of behind doors and where they can be seen much easier. All along, the problem has been that we receive many duplicates based on common skin disorder and how our products have provided solutions and relief. Now, we have figured out how to semi-automate the process. Also, if you look at the speed bar above, there is a tab for testimonials and a form to submit your own. We encourage you to submit anything that our products did to help you so that we all may be able to help others. For convenience, you can use the form below to submit entries right from within this article. 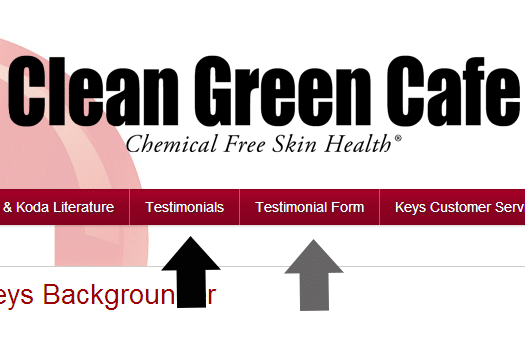 This area is for your testimonial of what Keys products did for you. Let us know your reasons, thoughts and the results.